Get the best customer rating and review module for PrestaShop, and increase your conversion rate significantly! Moreover, with Google Rich Snippets, benefit from visually enhanced results on Google's search engine and increase your click rate, number of visitors and sales! 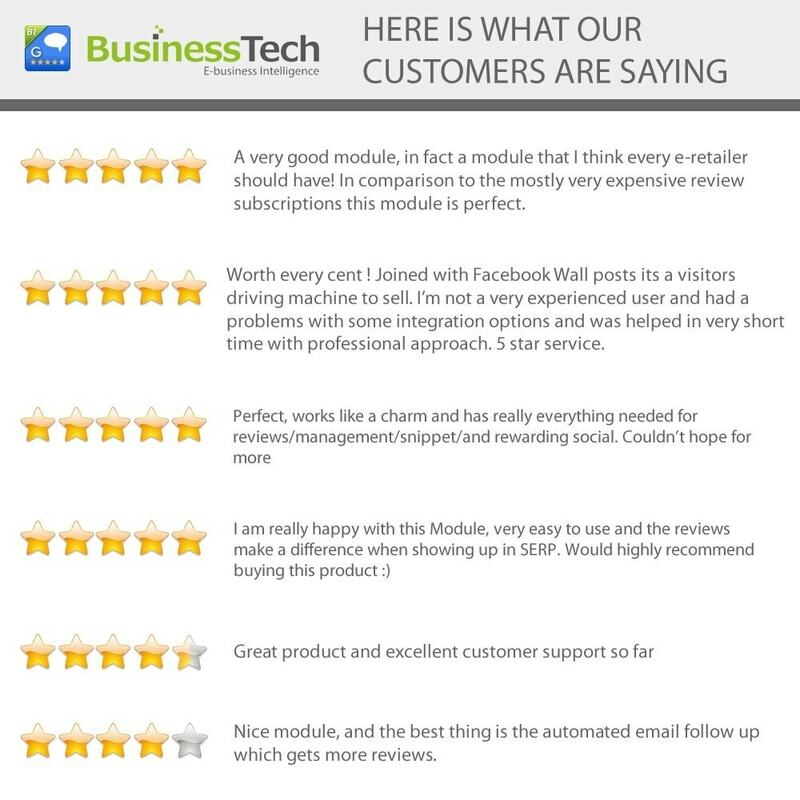 If you have already purchased our "Wall Posts" module (sold separately on https://addons.prestashop.com/en/products-on-facebook-social-networks/4429-wall-posts.html), you can have any rating / review automatically posted on your Facebook page. The mechanism also integrates very well with the moderation tool, so that if moderation is enabled on the module, reviews will only be posted to Facebook once validated. This module is developed by BusinessTech, certified PrestaShop developer, with over 8 years of experience working with Google and Facebook and 4 times winner of PrestaShop Awards. You are guaranteed to buy a robust, reliable and quality module. Furthermore, at BusinessTech, we have a fast and efficient tech support : when you contact us, you are talking directly to the developers, so you are sure to be well informed ! 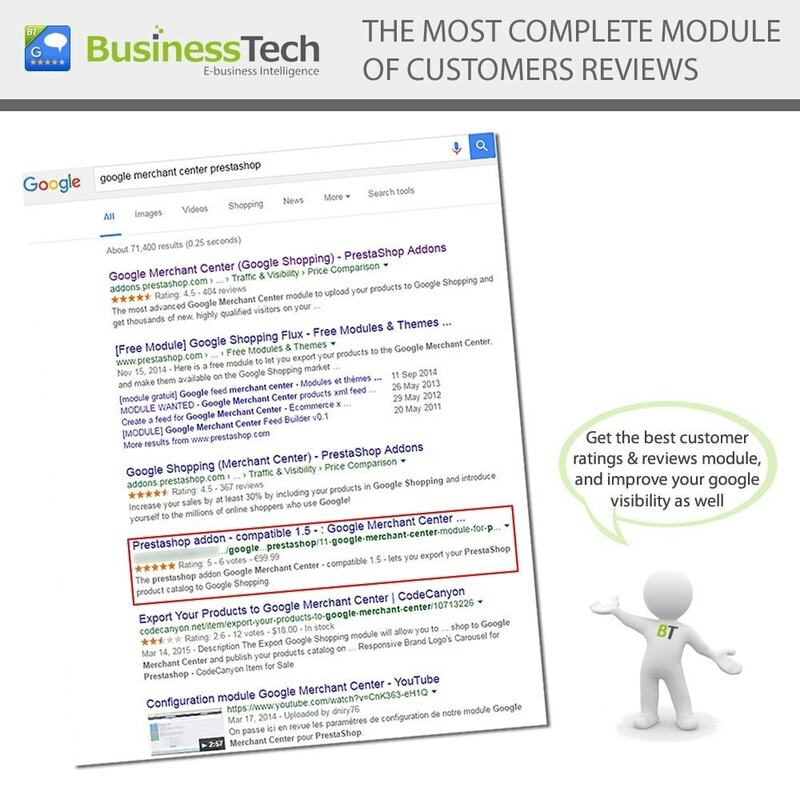 Brought to you by BusinessTech, the creators of the "Google Merchant Center (Google Shopping)" module (available separately on https://addons.prestashop.com/en/price-comparison/1768-google-merchant-center-google-shopping.html), the "Customer Ratings and Reviews Pro + Google Rich Snippets" module is a 2 in 1 module and offers a rich selection of features and functionality. 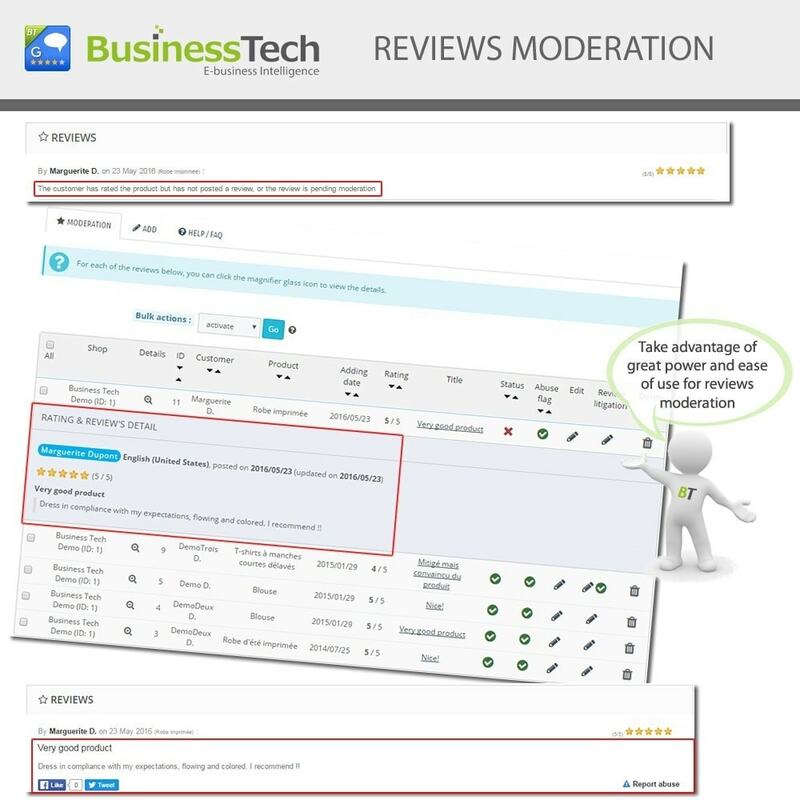 Advanced rating and review moderation / modification tool (*): ability to require moderation/admin approval for written reviews to be posted, ability to edit written reviews to correct any typos or mistakes, or slightly adjust the verbiage, as well as the ability to delete a review altogether. Ability to place a link, next to the list of your product reviews, to one of your CMS pages (*) detailing your review management policy (for example, the possibility or not to modify a review and the modalities of the modification). (*) Following the application of the decree n ° 2017-1436, if the head office of your shop is located in France, it is your responsibility to inform your customers of the way in which their reviews are processed. You have the ability to import your product ratings and reviews from any product feedback plateform allowing an exportation in CSV format, as for example "Verified Reviews" or "TrustPilot". In this way, you can keep your ratings and reviews history! Of course, if your reviews come from the "Product comments" PrestaShop native module, you can also import them very easily. 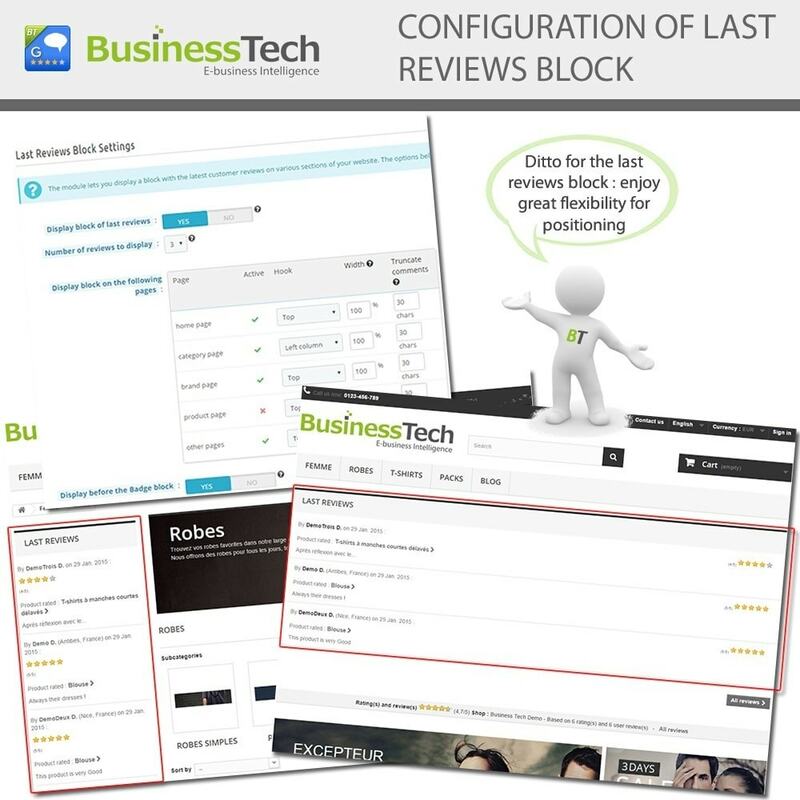 Our module allows you to export your ratings and reviews in a CSV file. Google's Rich Snippets consists of additional HTML code added on your product pages, which is invisible to visitors. They allow you to turn your regular search engine results into visually enhanced, eye-catching results, at no additional cost (see https://developers.google.com/structured-data/testing-tool/ for an example). Products benefiting from Rich Snippets will include additional product information such as category, price, and may also include other details such as brand and even a photo (which elements are included are up to Google though). 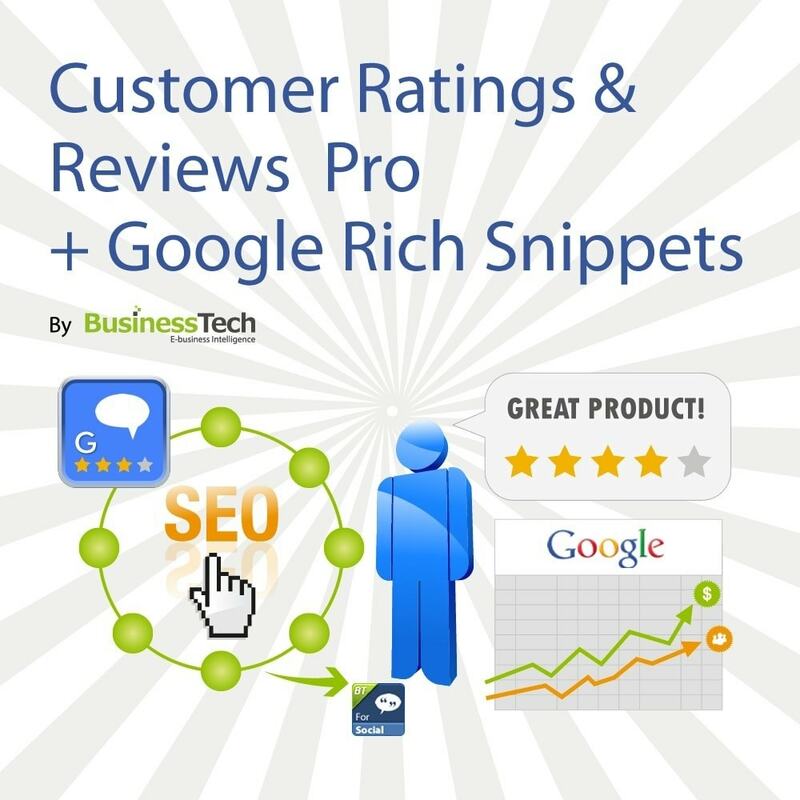 If any ratings and reviews have been posted for the product, your listing in Google search engine results will also include its rating, displayed in the form of stars. This greatly enhances your visibility and will result in a much higher click rate on your links, even if you are not in the top results. So that your customers and visitors can easily see what is the average rating assigned to the products of one of your categories or brands we have included the possibility to display on these list pages a badge summarizing the average rating on these products. Upon installation of the module, you can also import all your past orders and invite your customers to post reviews on these past orders, so as to quickly start populating your online shop with customer reviews. 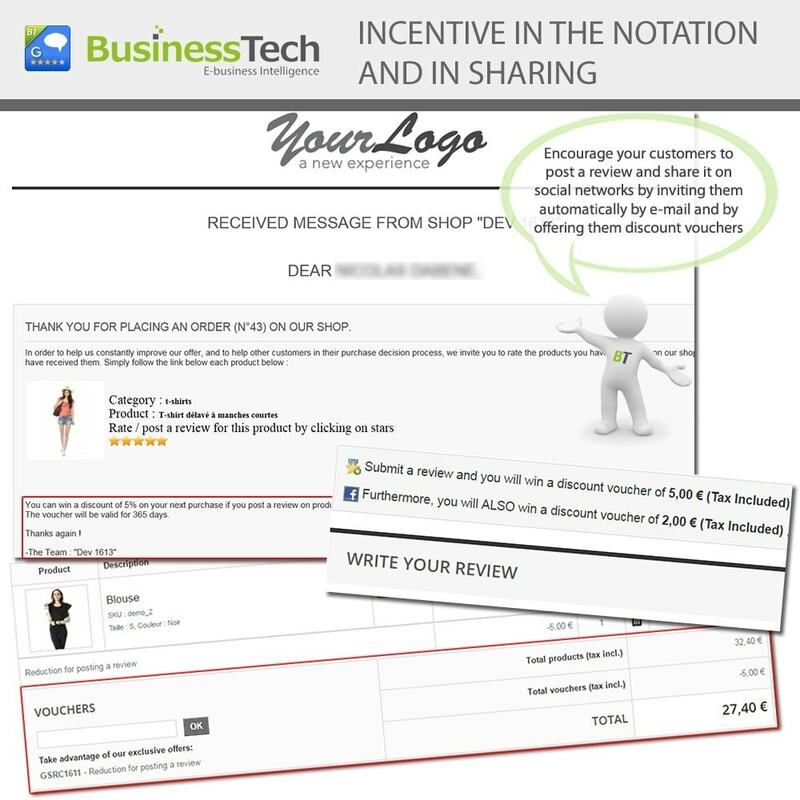 You can also configure vouchers with small amounts as an incentive to encourage your customers to review your products and then share these reviews on Facebook. The 2 voucher systems (for posting a review and then sharing on Facebook) are independant and you can configure either, both or none. If you do so, customers will be informed of this fact both on your product pages above the form to post a review and via the reminder e-mails, further boosting the share of people who will review your products. If you have already purchased our "Wall Posts" module (sold separately on https://addons.prestashop.com/en/products-on-facebook-social-networks/4429-wall-posts.html), you can have any rating / review automatically posted on your Facebook page. The mechanism integrates nicely with the moderation feature, so that reviews will only be posted on your page once they have been approved from the moderation interface, if moderation has been activated. Your customers will enjoy the ability to rate your products, and the enhanced results in Google's search engine results will also give them a positive image of your website. 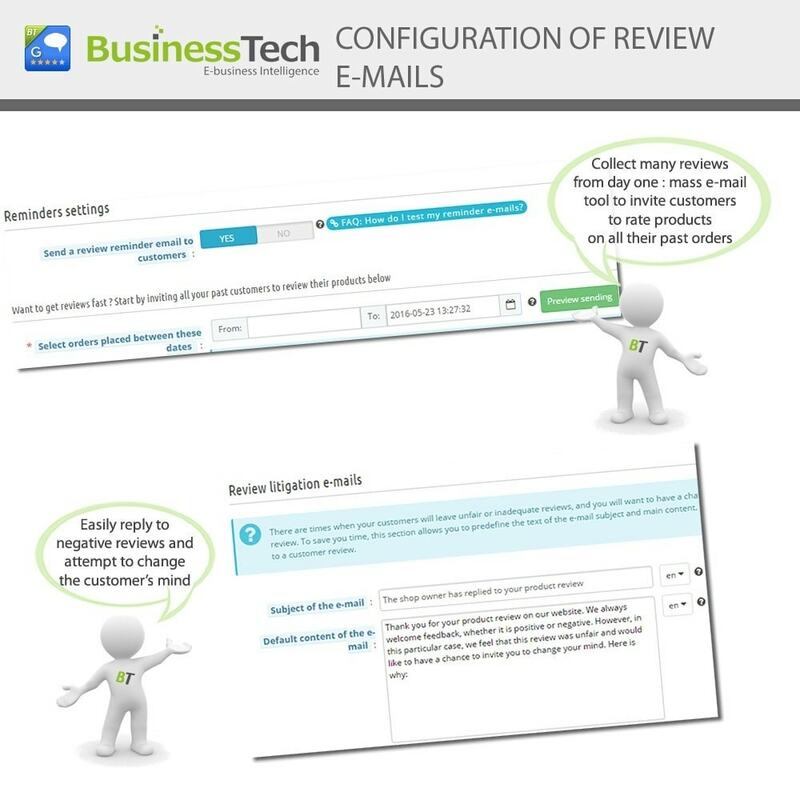 By installing this module, in addition to the implementation of a rating and review management system, you allow your customers to react to feedback on your products through tools made available by Facebook and Twitter(“like” and / or"share" buttons). Regarding this, Facebook and Twitter are likely to access certain information relating to their browsing. We remind you that, as responsible for the use of personal data of your customers and visitors and in order to respect the new European General Data Protection Regulation, you must clearly inform your users of this, in an easily accessible documentation(e.g. your Terms and Conditions). You must provide them with the links that will direct them to Facebook and Twitter’s personal data policies. You also must inform them of their rights, in particular their right of opposition to the use of their personal data and the means to assert their rights. 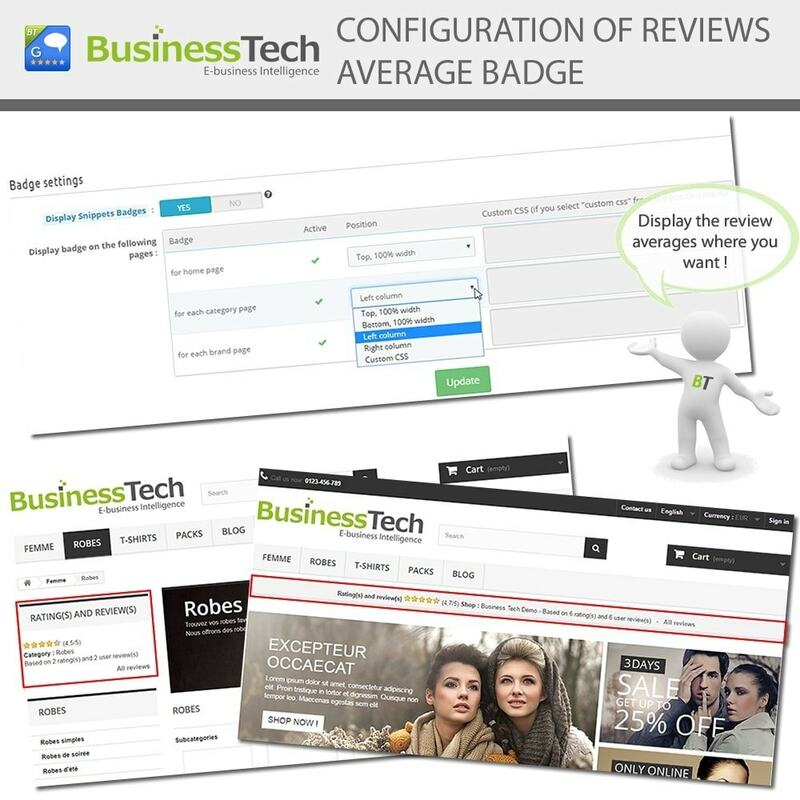 This is a great Module to stimulate reviews and therefor improve conversion, seo score, ... Highly recommended to take your shop to the next level of professionallity!